The Center for Civil and Human Rights announces a call to artists for "Learn Promote Defend", held December 10, 2008 at Mason Murer Fine Art in Atlanta, Georgia. Awards: Public art exhibition and potential to become part of CCHR's permanent collection. Open to all professional artists 18 years of age or older (as of January 1, 2008) from all geographic locations where this Competition is not prohibited or restricted by law. Interested artists should interpret one or more articles of the UDHR (the preamble and thirty articles may be read here) and provide a Resume and Artist's statement. Entries will be accepted in all two-dimensional visual arts media, including, but not restricted to: painting, drawing, watercolor, weaving, photography, prints, video, film and digital animation. The work entered may be traditional, representational or more experimental, but it must be based on one or more of the articles of the UDHR. Questions? Please contact Tiffany Powell at tpowell@cchrpartnership.org or call 404.658.1877. 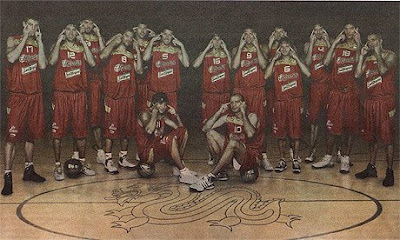 Already with one of the most disturbing histories as a nation, Spain's basketball team adds to it with this sad ad in a Spanish magazine, which depicts the Spanish Olympic basktetball team pulling back their eyes to mimic the Asian epicanthic fold. Phone: (312) 726-6200; or check website here. "Lin Miaoke, left, is shown during the opening ceremony of the Beijing Olympic Games on Friday. An official ordered her to lip-synch 'Ode to the Motherland' because seven-year-old singer Yang Peiyi, right, wasn't deemed cute enough."